Create a Cloud Spanner instance, database, and table. Note: For information on the cost of using Cloud Spanner, see Pricing. When you first use Cloud Spanner, you must create an instance, which is an allocation of resources that are used by Cloud Spanner databases in that instance. Go to the Spanner page in the GCP Console. For the instance name, enter Test Instance. For the instance ID, enter test-instance. Choose any regional configuration from the drop-down menu. Your instance configuration determines the geographic location where your instances are stored and replicated. Use 1 for the node count. Your instance appears in the Spanner Instances page. Go to the Spanner Instances page in the GCP Console. Click the Test Instance instance. Skip the Define your database schema step for now. You'll define your schema in the next section of this quickstart. 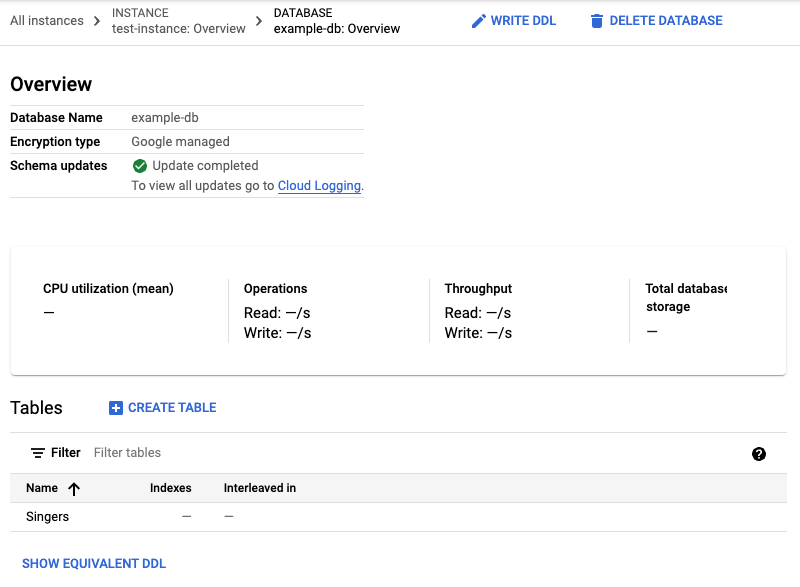 The GCP Console displays the Database details page after the database is created. 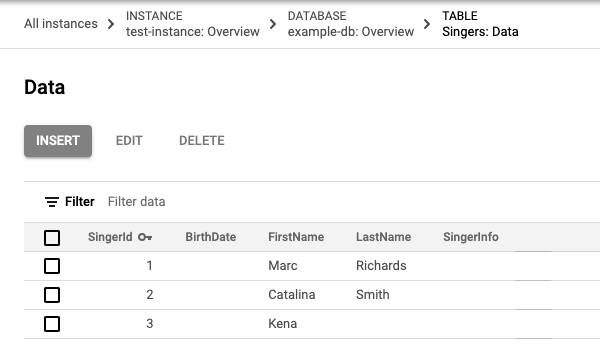 By using the default Database editor to specify each part of tables, columns, and indexes. By switching the editor to Edit as text mode and entering SQL statements in Cloud Spanner Data Definition Language (DDL) syntax. In the left pane of the GCP Console, click the example-db database. Click the Edit as text toggle. The GCP Console provides an interface for inserting, editing, and deleting data. In the left pane of the GCP Console, click Singers. Click Insert to add an additional row. You can also insert empty string values when you enter data. In the left pane, click Singers. Check the box next to the row for SingerId 3, then click Edit. 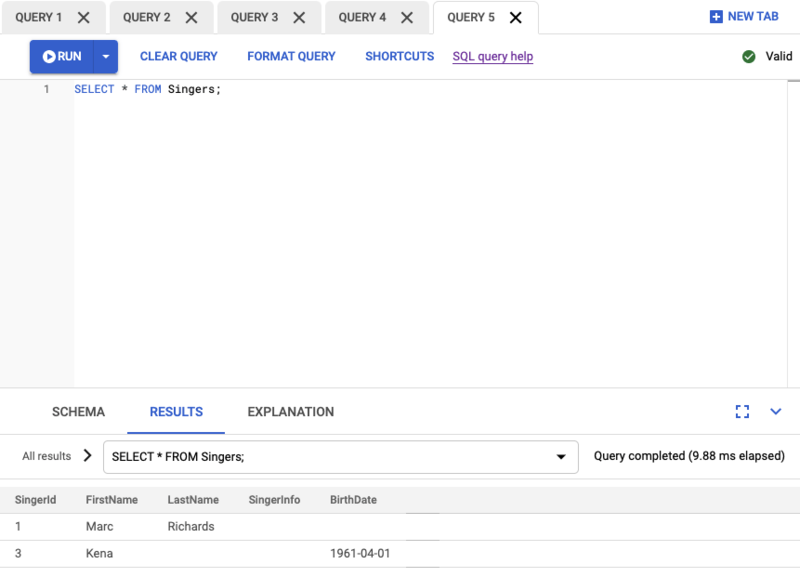 Check the box next to the row for SingerId 2, then click Delete. 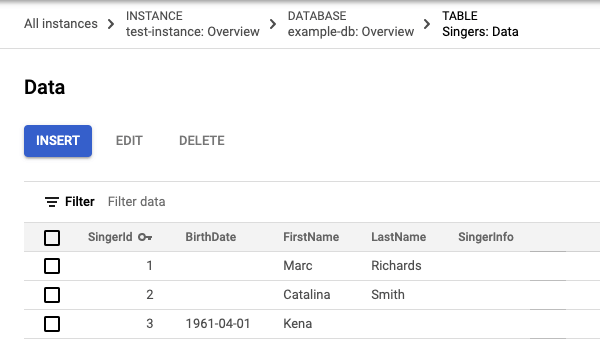 You can now execute a SQL statement on the query page. 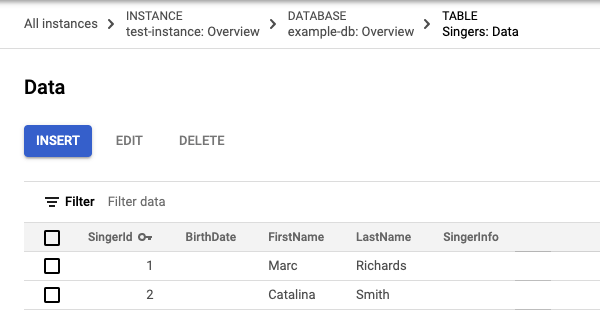 In the left pane of the GCP Console, click example-db to navigate to the Database details page. On the Database details page, click Query. Congratulations! You've successfully created a Cloud Spanner database and executed a SQL statement using the query editor! To avoid additional charges to your Google Cloud Platform account, delete the database and the instance that you created. Go to the Spanner Instances page in the Google Cloud Platform Console. In the Database details page, click Delete . Deleting an instance automatically deletes all databases created in that instance. Understand the Cloud Spanner Schema and Data Model. Learn more about Data Definition Language (DDL). Learn more about Query Execution Plans. Write data into Cloud Spanner using C#, Go, Java, Node.js, PHP, Python, or Ruby.